A Diamond is for Ten Months. While I was home I went to Starbucks to get coffee (by which I mean a strawberry smoothie) with one of my very favorite people from high school. She asked me if I was really as happy as my blog made it sound like I was… Because it was kind of sickening. Didn’t I ever have a bad day? Why couldn’t I blog about one of those? Well Kate, this is for you. Some people pick the wrong guy. I apparently just picked the wrong ring. When Evan and I started ring shopping last April, I knew I was looking for something different, not the usual Provo rock. First of all, I wanted it in yellow gold, which many a sales person quickly assured me was not really in style, I should get white gold instead. Um, excuse me? Aren’t you trying to sell me a product? Do not insult my taste! Second of all, I wanted it simple. Don’t get me wrong, I am all about jewelry, but I like it small, delicate, feminine. I wasn’t looking to go into debt when we were just about to start out lives together. Plus, for some reason I find it perfectly romantic when you see a rich doctor’s wife still wearing her tiny original wedding band they got when they were young and starving and poor. Not that Evan has any desire to be a rich medical doctor… but he has expressed interest in getting a Ph D. That counts too right? Anyway, I was planning on a solitaire and then I stumbled across this little beauty and fell in love (again). It was perfect! Or so I thought. However in June, two months after Evan proposed, we were scouring Craig’s list one night looking for an apartment to turn into our new home when he looked down at my hand and discovered that the center stone of my brand new ring was gone. What! Okay I have heard of this happening occasionally. Never after two months, usually like twenty-five years, but I guess there’s a first for everything. 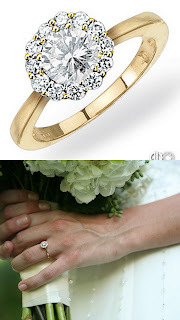 I cry, the ring goes back to the jewelers’, they replace the stone, and Evan purchases insurance. I obtain the habit of looking down at my hand every five minutes to double check that nothing has disappeared and I decide not to wear my ring while I’m at the gym, just for good measure. August: I’m washing my hands on my way to work and look down and discover I’m missing two diamonds, side stones this time. Okay this is getting ridiculous. Back to the jeweler, diamonds replaced and prongs strengthened. No tears, just frustration. I stop wearing my ring to work. Fast forward, November: I’m doing laundry, getting ready to head home for Thanksgiving, look down again and another diamond is missing. Seriously?? Back to the jeweler, they send the ring back to the manufacturer and remake an entirely new ring. I no longer wear my ring while doing laundry, dishes, cooking, showering or sleeping. So as far as ring-wearing activities go, that leaves…. going to church, reading books, and possibly driving in light traffic. Cool. My ring spends about 65% of its time in the ring box next to my bed so I can live my life like a normal human and not lose diamonds. I’m furious, as this defeats the purpose of even having a wedding ring, but that should take care of the problem at least. Nope, last week heading out the door to the airport, I look down, yet another diamond missing. Game over. After finally getting an appointment with the storeowner I head into his office to see just what he can do about this. He immediately informs me that it is probably my fault because some people break mercury thermometers and that destroys their rings from the inside out. Hi, welcome to 2011. Perhaps you haven’t been to a doctor’s office in a decade or two, but we actually just use digital thermometers now, thanks. Okay, I didn’t really say that. Well, he had another lady who kept losing diamonds, and it was her fault because she was a pro golfer. Sir, I am not a pro golfer. And I can prove that to you right now with one swift swing of a club, right here in your office if you’d like. Okay I didn’t really say that either. But I wanted to. Well they probably fall out when you lift weights. I’m sorry did I not make it clear that the only time I ever wear my ring is when I’m sitting perfectly still and occasionally when I am breathing? And then I politely suggest what he should do, allow me to pick out a new ring at the appraisal price for the one I have. His response to which is yelling at me for telling him what to do in his own store. Okay, maybe I didn’t suggest it all that politely. But considering a wedding ring is supposed to last your entire life, I felt he had some making up to do for a ring that was dumping diamonds every couple of months. So then he offered to remake my ring in white gold. What is with these people and their white gold! To make a long story short, after two hours of rather awkward and uncomfortable negotiating, I begrudgingly agreed to give up my old ring due to its design flaw and instead trade it in for a new one, a solitaire. To replace the missing halo, the diamond is nearly twice the size. Your first anniversary is supposed to be paper, but I guess the diamond approach works too. I’m sad to give up the ring Evan proposed with but happy that I will not have to visit that store any more. haha...You're cute and your new ring is BEAUTIFUL and OH SO CLASSY!! Love you! My ring almost looks exactly like your original ring. I remember having a nightmare right after getting it that I lost the main diamond in it. Loved the examples of activities that were appropriate for ring wearing. wow..this makes me sick..and MAD! You are the best blogger ever and I love reading your posts!!! :) Even when they are about bad days. Not that I want you to have bad days of course. But I just love reading about your life. You are hilarious! Hahaha what store did you even get that at? You need to make sure we all steer clear! This would have been the funniest post I have ever read, BUT I was there for most of this.....so it was too real, and the owner was an arrogant jerk, who I wanted to slap....just sayin...you are so fun to read!!! Love ya! I have the same problem. We had my ring custom made with sapphires and blue topaz on the sides and though I will say that I am lucky to not have lost any, they are always coming loose. I'll go into clean my ring and another stone is loose. Its driving me insane as well. I really only wear my ring to church. I'm thinking about just getting a tungsten band like jareds to wear throughout the week.